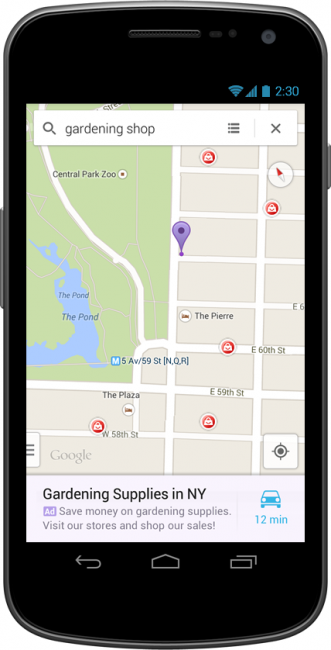 Today, Google announced the return of clickable ads for the Google Maps app for Android. When a user makes a search for a particular place/business, a corresponding result with be featured (advertised), which will then allow for the user to either look up that business’s information and from there, the choice is the searcher’s. This is big for business owners that are looking to bring more attention to their stores, given that Google Maps is currently used by over 1 billion people every month. Relevant ads on the Google Maps app can now appear at the bottom of the screen after a user performs a search. They include a title, ad text, and a link to get directions. Users can tap or swipe upward to see more information — this is a new click type known as “Get location details” and results in a standard CPC charge. Google is pretty well known for showing the right ads at the right time, so don’t be alarmed if these new ads tend to help more so than get in the way. At least, we would hope so. Rumor: Motorola Nexus Coming in Q4?